The Feral Cat Foundation (FCF) is an all-volunteer, non-profit organization whose primary mission is to help people live with the feral and forgotten cats and kittens in the communities of Alameda and Contra Costa counties of northern California. We accomplish this through the nationally-recognized and effective method of "TNR" (trap-neuter-return). When possible, tame cats and kittens are adopted to loving homes. 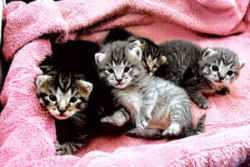 Cats that cannot be socialized are returned to the location where they were trapped and fed daily by caring volunteers. The lack of resources and a sanctuary prevent FCF from being able to take owner surrenders, rescue cats from shelters, or remove cats from neighborhoods. We invite you to read FCF's Commitment Statement and hope you enjoy your visit to our website. "Saving one cat will not change the world, but for that one cat...the world will change forever." The members of Feral Cat Foundation save " that one cat" time and time again in the course of a week. Click here to read our current newsletter and see how we are changing lives. It is very important to assess the age of kittens BEFORE handling them. If you pick up a kitten that still has it's eyes closed, chances are the mother will reject the kitten. Babies this young have a very slim chance of surviving with bottle feeding. On the other hand, waiting until a kitten is 6 months old to attempt socialization is also asking for disaster. Here is a guide to age and appropriate action. NEW! Find us on Facebook, Twitter and Instagram! Click for current high priority needs. Click here for other easy ways to help FCF kitties! Loki is a great big teddy bear! 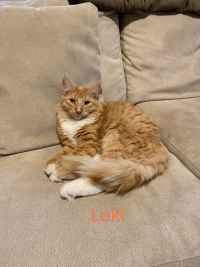 He loves to snuggle and purr, lets kids carry him around the house without complaint and will chat with you about his day. 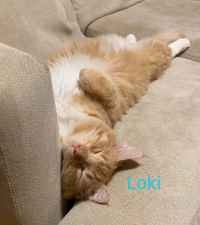 But Loki also thinks he is a dog and loves to chew up and destroy stuffed animals so keep the kids toys put away when he is left on his own. At just 9 months old, Loki is still active and playful as a kitten. He would do well with another male cat or gentle dog to cuddle and play with. You can meet Loki at the Petco in San Ramon on Saturday between 1am and 3pm. We have wonderful cats looking for homes Many have lost their homes and families. The kitty above, those on our Available Cats pages and many others are waiting for their “forever home”. Will it be yours? Making a difference – one cat at a time! View FCF spay, neuter, and adoption statistics since the group’s start in 1998. Copyright © 2008 Feral Cat Foundation All rights reserved.